1/12 Season Two, Episode Eight: Affair at Bromfield Hall- Scarecrow and Mrs King | "Just walk with me.."
The final European episode!! It’s been wonderful!! No thanks to TWAAAAAA!!!!! LOL we don’t even get to see the episodes’ title before we are reminded of how great TWA is!! Compulsory footage of a TWA plane landing??? – Check! Now that contractual obligation has been fulfilled.. let’s get on with the show!(Please!!!!!) Oh no… this is ridiculous! 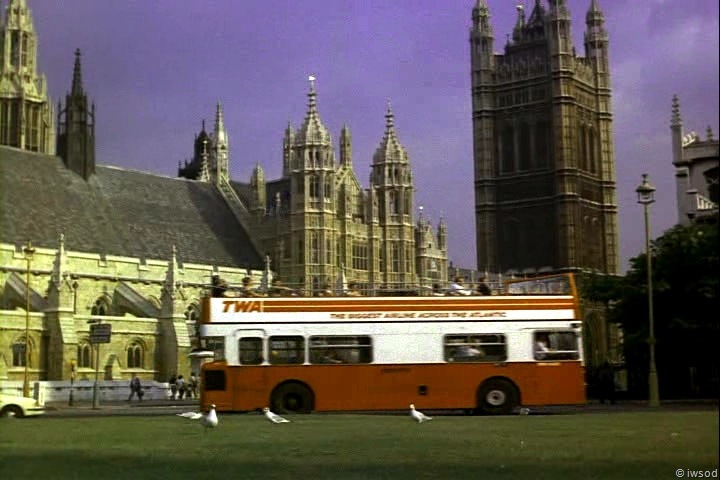 TWA are not done with us.. we have to watch a TWA advertisement on the side of a bus passing the houses of Parliament! ugh!! Wait a minute! We saw this same shot in To catch a mongoose!!! we did!! we did!!! 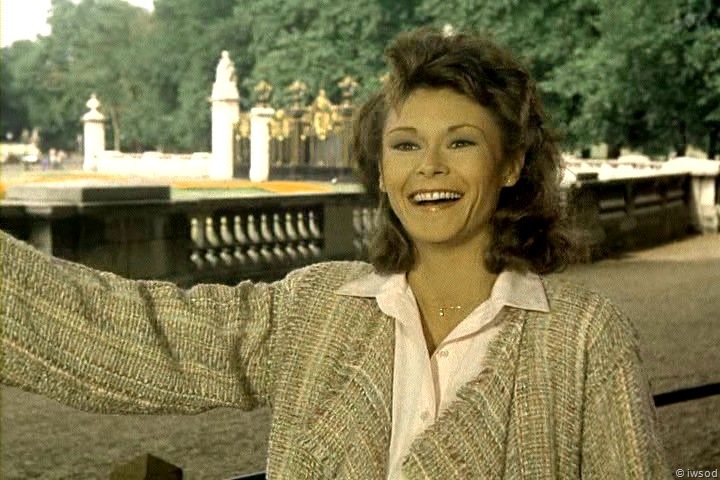 https://justwalkwithme.com/2012/07/10/1-season-two-episode-1-to-catch-a-mongoose-scarecrow-and-mrs-king/ here! at the bottom of this post you can see it! LOL!! Not only were smk saving money by sucking all the $$ out of TWA they could.. they were sucking whatever value out of their filming they could get too! I am pretty sure these two episodes were filmed at the same time.. for a number of reasons – but keep an eye out for any reused shots and let us know if you find any! duh duhhh duhhhhhhh!!! [Cue the scarecrow music! ] 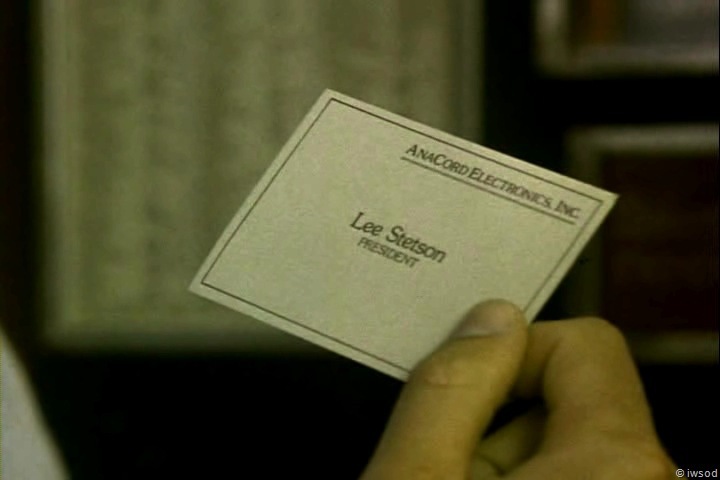 Okay, does it crack anyone else up that this is the business card the dead guy pulled out to dial a phone number?? what’s missing??!!! err a phone number! tee heee!! Whooo hooo finally we see Lee and Amanda! President Lee: to Anacord Electronics, Incorporated. 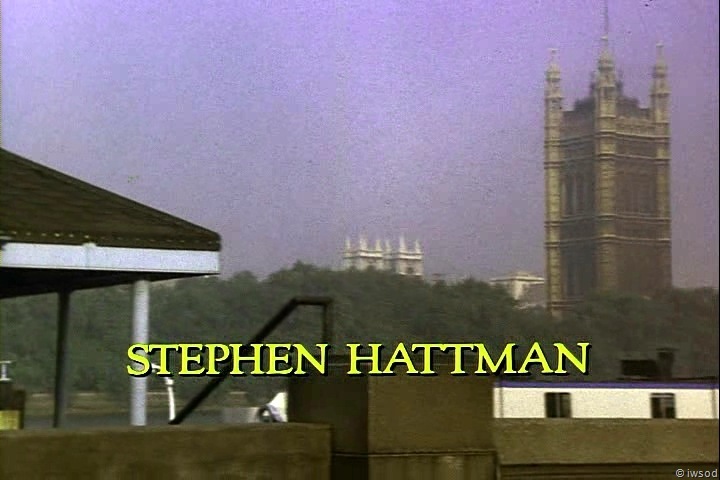 Make it directly to Hattman. Anyway, Lee dictates some boring and meaningless info to Amanda- and Amanda is concentrating on her shorthand..
Lee seems to be giving her surreptitious ‘ isn’t she too cute’ looks as she is so conscientious in her shorthand! Well.. what’s the point of having a cover if you aren’t going to do it properly? isn’t that the point?? Mr let’s pretend I am an important company president dictating to my secretary – but then pull Amanda aside to have a quiet word with her that this is only a cover? Aie! I think Amanda is better at this cover stuff than Lee! she seems to understand it is important to sell it, and maintain it! Lee asks his driver to excuse them for a moment, and he pulls Amanda to one side saying: Amanda, could I talk to you? Amanda: I’ve been getting into it. Lee: Uh huh. but look.. [Lee grabs Amanda’s note book from her] Ahhh (he lowers his voice) it’s really not necessary to write all this down. Lee flips through the pages: A haa..
Amanda: I really haven’t used it since I learned it in high school. Lee: Yeah well, I’m really not saying anything that’s making any sense. Just as an aside, do you think this is directly after To Catch a Mongoose? maybe after their high tea at the Ritz or wherever, this assignment came up..[does the TWA jet signify they arrived by plane? could have been the dead guy? hmm I’ll have to keep an eye out for further clues! Amanda is wearing the same outfit that she was wearing at the end of TCAM! Wait a minute!! Lee is wearing the same shirt and tie that he is wearing at the end of that episode also! 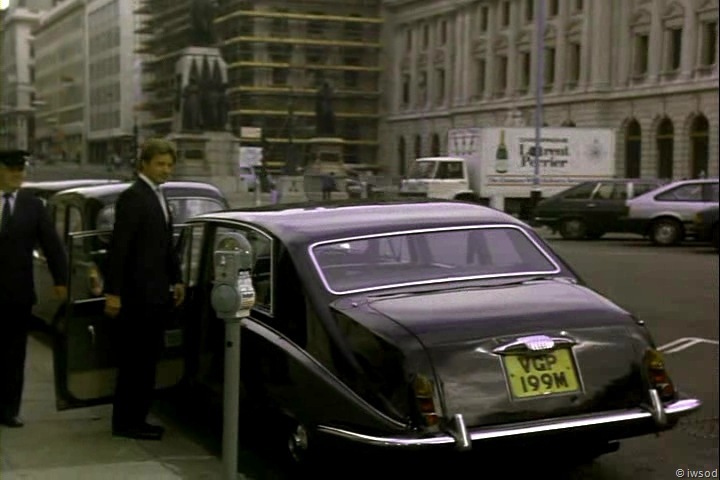 (in front of Buckingham palace) My goodness.. Ok I will try not to compare the two episodes too much or this could get bogged down! whoo Lee is in town by invitation of MI5 to investigate a major breach in the anglo-american intelligence community.. Hmmm.. I thought MI 6 did the international stuff.. I’m confused! Lee is undercover as the president of an electrical company, and Amanda is his ‘window dressing’ secretary..
Lee: that’s why you’re here. Lee seems to be enjoying this… ugh! And so continues Lee’s minimizing of Amanda’s contribution! (Yes, I am of the opinion this episode comes before Brunettes are In!) Lee is conflicted.. he thinks Amanda isn’t as good as an agent, but then he doesn’t want her to take the dictating too seriously.. is it a cover or not? aie! I think it is an indication that Lee is conflicted when it comes to Amanda, how he sees her, what he expects from her..!!!! I’ll have much more to say about that as we go through this episode! Whooo and I love how Lee walks back to the car to leave, and before he hops in, he turns back to watch Amanda walk away! wishing you could go with her Lee? Suffer Lee!!!! Stay away from those historical London walking tours Amanda! bad memories of the mongoose! Ok.. that’s it for now!!! As always I would love to hear any comments, insights questions or whatever you would like to share! Thanks so much for reading!! byeeee and back with more soon! 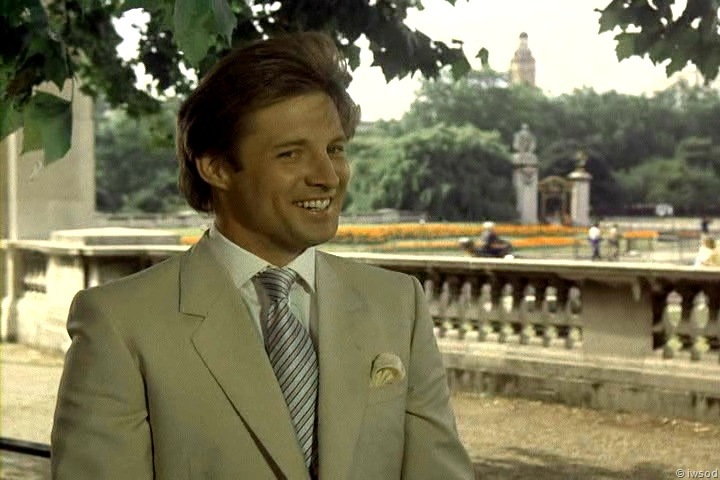 This entry was posted in Season Two and tagged 80s TV series, recap, Scarecrow and Mrs King, SMK, spy. Bookmark the permalink. Stereotypes? Tell me about them. I think quite a few non-Germans still believe that Germany=Bavaria. Now I’m from northern Germany (Hamburg, to be precise), which is a whole lot different if only for the fact that we’re closer to the sea than to the mountains. And boy, does that stereotype bug me! 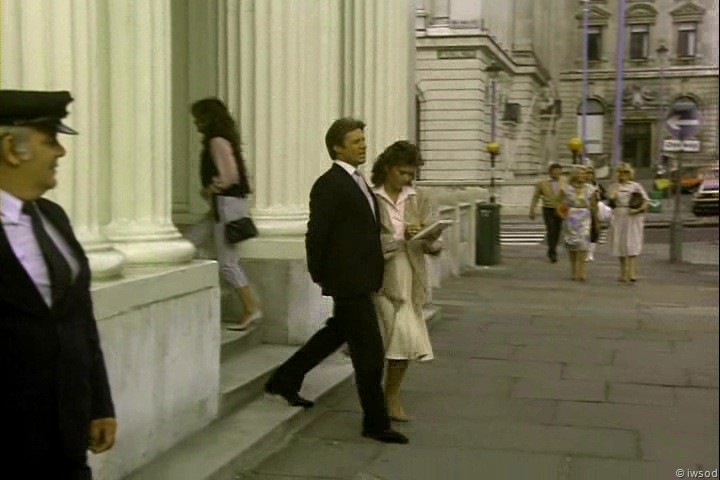 Pingback: 6/14 Season Three, Episode 05: Welcome to America Mr Brand- Scarecrow and Mrs King (Blog order- Episode 01) | "Just walk with me..."
I remember liking this episode when it first aired (I’m such an Anglophile) and I still like it. Re the “window dressing” remark, I don’t think Lee meant to be insensitive. I suspect he’s used to working with civilians who know that’s their role – to be a prop – and although he now knows Amanda considers herself much more of an active participant, he still occasionally falls back into his familiar working style. My sense is that Lee doesn’t have a lot of experience interacting with others as people – most of the individuals he encounters are like pieces on a chess board, to be used and manipulated as needed to “win the game.” Amanda is challenging those assumptions: she constantly reminds him that other people have feelings, ambitions, desires and needs. He’s learning … but change takes time! I too don’t get the whole lets act out our covers and then have a stupid conversation about how it’s all an act. Duh Lee I think Amanda had kinda guessed that already. Window dressing?! Boy Lee you sure know how to put your foot in it. With both feet! And despite this Amanda still looks disappointed that she’s got time off to go sightseeing…..
Pingback: SEASON 2 Quick Links | "Just walk with me..."
Hi I’ve been busy with national security issues and a dashing spy 😉 No really just busy being a housewife in Wauseon, OH with my 4 small kids 🙂 But, Iwsod I have been reading your blog and enjoying it and everyone’s comments!! I love how when Amanda turns to leave she shakes her head, rolls her eyes and mutters, “window dressing”. It seemed to me she was thinking ‘That Man’!! Lee conflicted … yes, he is and it’s just going to get worse before it gets better. 🙂 This is a favorite episode because that conflict really shows itself here. I’m trying to be patient, really I am. Hiya ‘get the king woman’..GTKW? [not sure if you’re aware but my name ‘IWSOD’ stands for ‘I want smk on dvd’ ! ] I agree Amanda was disappointed.. not needed and just window dressing.. ugh!! that really bugs me!!! Hi Debilyn, so far I am finding this episode much more interesting than I thought I would!! There is a lot about Lee and Amanda and their relationship – once I decided to view the episode as being before Brunettes are in, I was much better able to make sense of it! I am starting to see why you would say this is a favourite episode because of the conflict – sooooo true!! It’s so funny you said you were trying to be patient Debilyn! I wrote in the second post ( which I am about to post) that I was sharing the same feelings I thought Amanda had: I think this guy is deep down a good guy, but also, my patience is running out with Lee!!!! :)Lee can’t treat Amanda like this anymore!! He needs to accept her in his life..
Amanda was kind of disappointed when Lee told her that he wasn’t going to need her for the rest of the day!